Bringing Link-OS® environment capabilities to the Desktop, the ZD500 supports powerful applications for intuitive use and management. 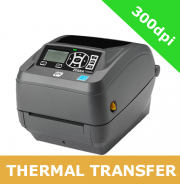 Delivering top-quality performance in the most demanding applications, it boasts a standard set of advanced features and supports both direct thermal and thermal transfer printing. Zebra’s ZD500 feature's Zebra's Link-OS environment - an innovative operating system combining a Multiplatform Software Development kit and software applications - making it easy to integrate, manage and maintain from any location around the globe. Coupled with intuitive ribbon and media loading, it's designed to be simple to setup and operate. Offering high resolution print quality and quadruple connectivity options, the ZD500 is compact and feature-packed for top performance. The ZF500 also has optional UHF RFID capabilities.